The Estates-General (French, États Généraux) was a representative assembly of the Ancien Régime. It was comprised of representatives from all Three Estates. Unlike modern assemblies, the Estates General did not meet regularly. Instead, it was summoned occasionally by the king, usually in times of war or crisis. The Estates General had no sovereign or legislative power: its role was simply to advise or support the king. The first Estates General was gathered by King Philip IV in 1302, during a conflict with the Pope. During the 15th and 16th centuries, the Estates General was convened sporadically, usually to obtain political, financial or military support from the Three Estates. The last Estates General before 1789 was held in 1614. It was not convened during the 72-year reign of Louis XIV, who considered it unnecessary in an age of absolute monarchical power. It was also not summoned by his successor, Louis XV. When Louis XVI convocated [called together] the assembly in 1789, many considered this a sign of weakening monarchical power. Between 1614 and the late 1780s, the kings of France tried to forget the Estates General. To summon the assembly would be a sign their absolutist monarchy was no longer absolute. But others, particularly France’s powerful aristocrats and liberal reformers, did not forget. During this 175-year period, there were several attempts to reform the national body. 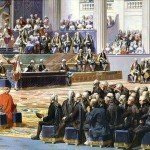 As flawed and powerless as it was, the assembly was France’s only national representative body – and the only place where the nobility could gather and directly challenge monarchical power. Demands to convoke an Estates General intensified in 1715, following the death of Louis XIV. His successor Louis XV came under considerable pressure from the parlements, who refused to register new taxes unless the king called the Estates General. Louis XV, who once declared he would “rather abdicate than call an Estates General”, responded by abolishing the parlements and appointing a new panel to register his taxes. A similar protest with the parlements forced Louis XVI to convoke the Estates General in 1789. In 1787 the king’s finance minister, Etienne Brienne, attempted to push through fiscal reforms that included a new land tax. Brienne’s proposal was blocked by the Paris parlement, which asserted that new taxes could only be approved by the Three Estates combined. This triggered an eight-month cold war between the royal government and the parlements. 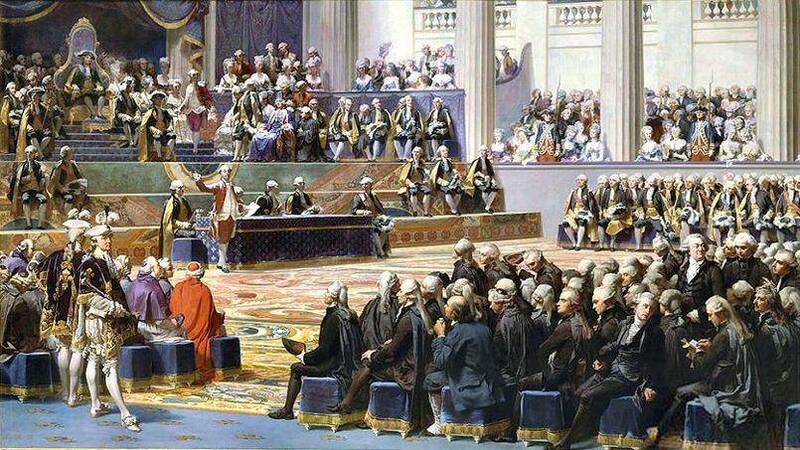 In November 1787 the king sought to win over the Paris parlement by promising to convoke an Estates General for 1792. 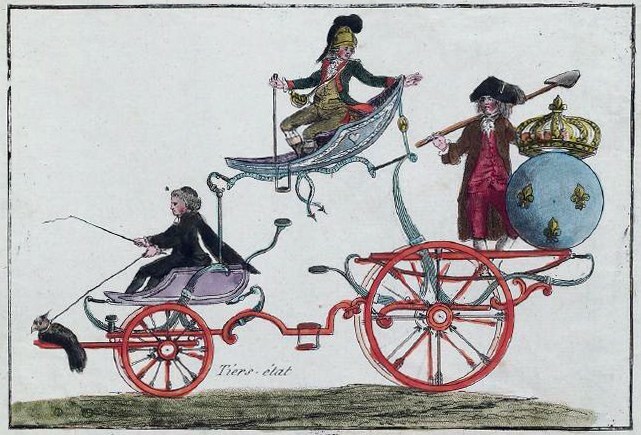 The deadlock continued until May 1788, when Louis XVI followed his grandfather’s tactic, suspending the parlements in favour of newly appointed courts. But this decision created public outrage and a degree of violence, including the notorious ‘Day of Tiles’ when soldiers in Grenoble were pelted with roofing shingles. On August 8th 1788, the king relented and brought forward the Estates General by three years. His decree convoking the Estates General claimed to look forward to “calm and peaceful days after the storm”. The question then turned to how the Estates General would be formed and what voting procedures it should adopt. Traditionally, the assembly had met as three separate estates. The First Estate (clergy) and Second Estate (nobility) both assembled in full regalia, seated to the right and left of the king, while the Third Estate (commoners) dressed in black and were seated at the rear. Voting at the Estates General was conducted by order – that is, each of the Three Estates deliberated on matters separately and cast one vote in unison. This electoral procedure meant the Third Estate, which represented around 97 per cent of the people, was regularly outvoted by the First and Second Estates, which represented the remaining three per cent. These procedures and precedents dated back to the previous Estates General in 1614, however, so it was unclear what might happen in 1789. The question was partly answered in September 1788 when the Paris parlement, now recalled by the king, issued the edicts summoning the Estates General. According to these edicts, the Estates General was to adopt its 1614 form and procedures, with the Three Estates meeting separately and voting by order. This triggered outrage among the bourgeoisie and in the pages of newspapers. The parlements, previously hailed as defenders of liberty and the people, were now condemned as servants of aristocratic self-interest. This gave rise to two slogans: “voting by head” (a call for votes to be decided by the ballots of individual deputies) and “doubling the Third” (a demand that representation for the Third Estate be increased twofold). In November 1788 the king, acting on the advice of Jacques Necker, recalled the Assembly of Notables to examine the issue. The Notables only confirmed the ruling of the parlements, insisting on the procedures of 1614. On December 27th the king, by way of compromise, agreed to double the number of seats for deputies from the Third Estate. The question of voting, however, was left unresolved. This was significant because no matter how many deputies were elected to represent the Third Estate, its voting power remained unchanged. On January 24th, 1789 Louis XVI issued another edict, providing instructions for electing deputies to the Estates General. Since the Ancien Régime had no framework for national elections, one had to be designed and implemented from the ground up. 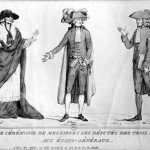 For the First and Second Estate, each bailliage formed an electoral assembly to elect its deputies; all nobles and clerics could attend these assemblies and participate in elections. The election of Third Estate deputies was more complex and involved several different stages. In the countryside, male taxpayers over the age of 25 were invited to participate in parish assemblies, which elected representatives to bailliage assemblies. In the towns and cities, there was an extra stage, with guilds and corporations sending representatives to a town assembly, which chose representatives to attend the bailliage assembly. The bailliage assemblies were responsible for electing deputies, as well as the compilation and submission of the cahiers de doléance. As might be assumed, this lengthy and indirect process was designed to keep radical voices in the Third Estate at arm’s length from decision-making. 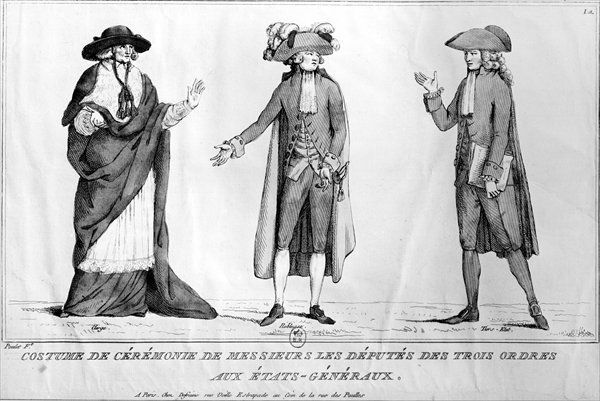 In addition, deputies to the Estates General needed to be wealthy enough to pay their own way to Versailles and remain there for several weeks. These factors shaped the composition of the Third Estate deputies, who were more representative of the bourgeoisie than the working classes. Of the 610 Third Estate deputies, almost half held some kind of venal office. Two-thirds were qualified in the law – and about half that number were practising lawyers. Only about 80 deputies were involved in trade or industry, most as business owners or managers. No peasants or salaried artisans sat as deputies. The composition of the First and Second Estate representatives also revealed certain trends. Ordinary priests and clergymen dominated elections for the First Estate; as a result of this, 208 of the 296 First Estate deputies were parish priests while only 47 were bishops. Seventy per cent of the Second Estate’s 282 delegates were military officers, serving or retired, while most of the remainder were landed aristocrats. 1. The Estates General was France’s closest equivalent to a representative national assembly. It was summoned by the king on an occasional basis to provide advice or support, usually in times of war or crisis. 2. Absolutist monarchy during the 17th and 18th century meant that the Estates General had not been summoned since 1614. A standoff between Louis XVI and the parlements led the king to summon it for 1789. 3. This triggered uncertainty and debate about how the Estates General would be composed and what voting procedures it would use. At previous assemblies the Three Estates had deliberated and voted separately, a procedure many considered unacceptable in 1789. 4. Elections for Estates General deputies were carried out by bailliage assemblies. These were straightforward for the First and Second Estates, however, the Third Estate elections involved several stages. 5. As a result of these electoral methods, the 296 First Estate deputies were dominated by parish priests, the 282 Second Estate deputies by military nobles and the 610 Third Estate deputies by lawyers and bourgeois interests. 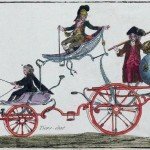 J. Llewellyn and S. Thompson, “The Estates-General”, Alpha History, accessed [today’s date], https://alphahistory.com/frenchrevolution/estates-general/.